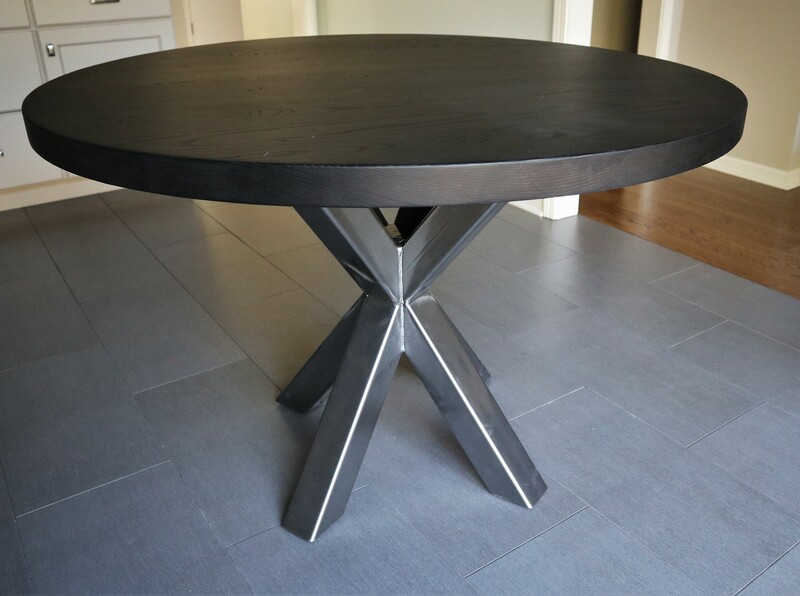 There are endless choices when it comes to tables, chairs, and table set designs. A space can be eclectic, modern, formal, transitional, so on and so forth. There is no one right way or style of design but simply what works for you, suits your personality and the needs of your home. 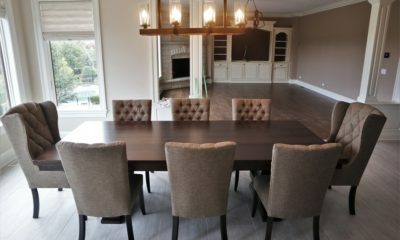 To get down to it, the intent of our latest blog is to inform and guide you in the decisions that come along with designing a custom table set with us. More specifically pairing different chair styles and designs can set the tone for a room. Having said that, let’s dive in to the comparison of mixed vs. matching, formal vs. informal, and traditional vs. industrial table sets and what each of these entail. There was a point in time in the design world where contrasting or different pieces of furniture paired together was not as accepted as it is now. Nowadays there is room for both matching and mismatched table sets. Mind you, there still is a proper and improper way to accomplish this. 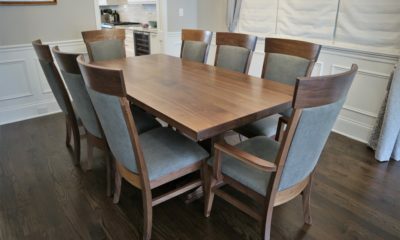 One of the options customers have when designing with us is their chairs, if in wood, be stained the same or a different color as the table. Keeping it simple, a table set with the chairs and table stained the same color is a clean, no-nonsense style. Jazzing a clean design up would be adding a different stain to the chairs. 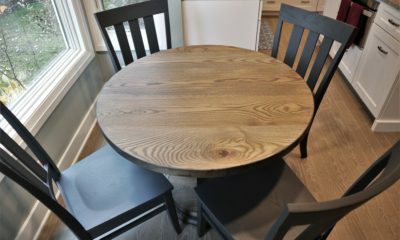 For this, the best way to go would be a darker version of what’s on the table or staining the chairs black. This can create some variation, depth, and interest without adding anything too extreme or “trendy.” It all depends on personal preference. 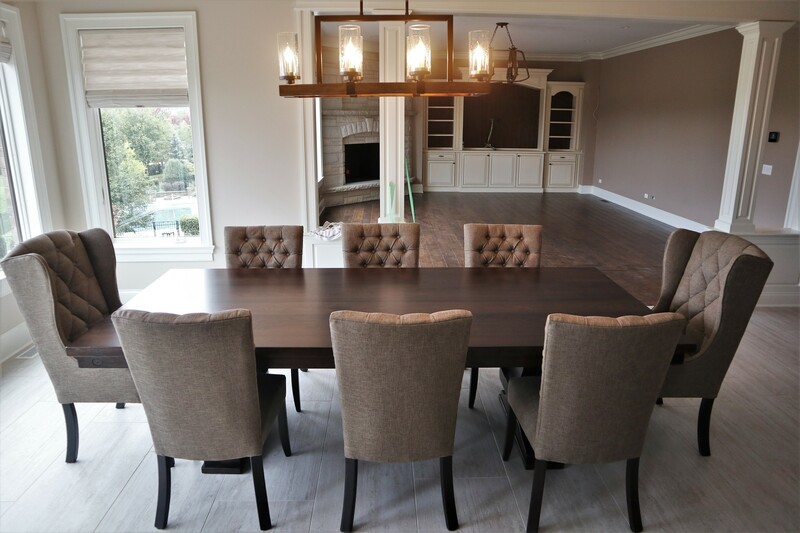 Typically dining room table sets are more formal whereas kitchen table sets tend to be a bit more relaxed in design. For many, when they think of a formal dining set, they think fabric. 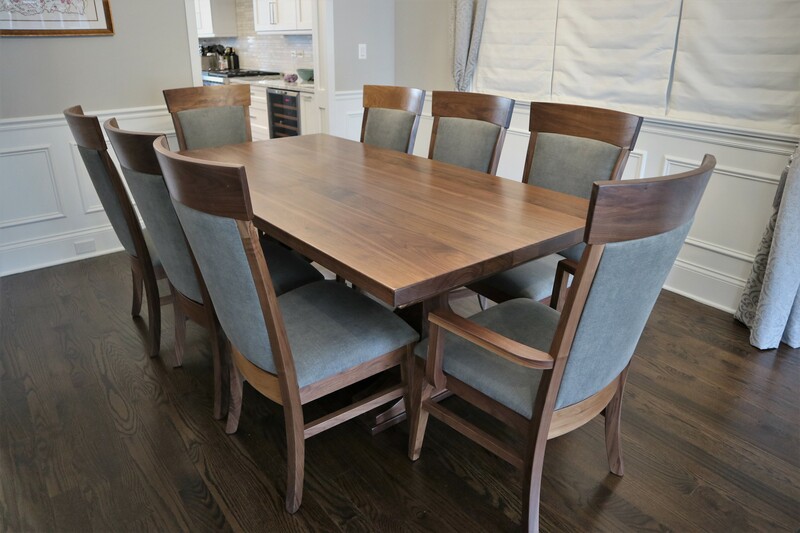 Whether their table is light, medium, or dark in tone adding, a touch of texture with fabric chairs can help differentiate between formal and informal dining. This could even mean fabric seats rather than a full fabric back and seat. Fabric or even leather chairs often dress up a room. 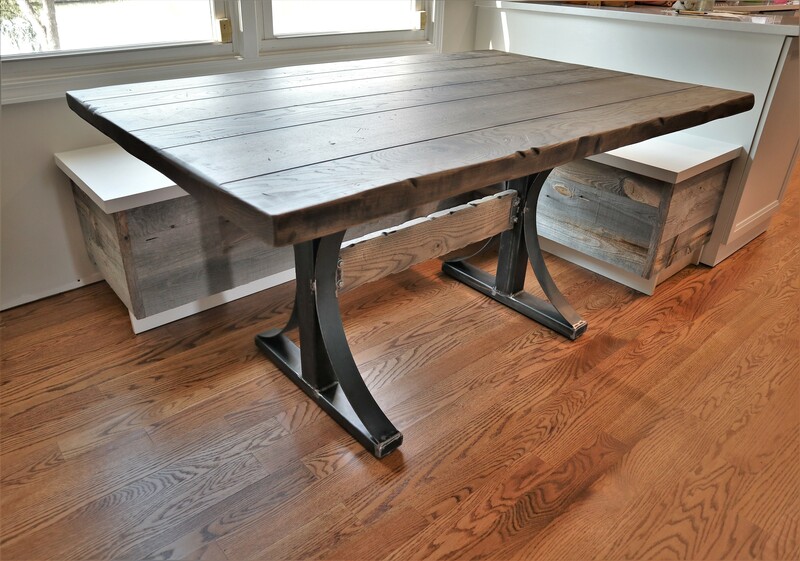 In contrast, informal table sets lend themselves to having wood chairs or even benches. We find that often our customers will mix wood chairs with a bench on one side. 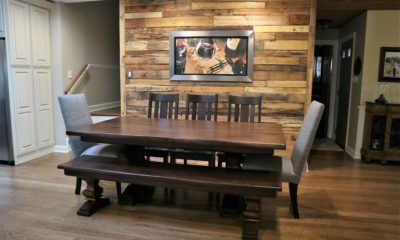 This blends seating styles and mixes up the traditional table set, not to mention the flexibility that benches allow. 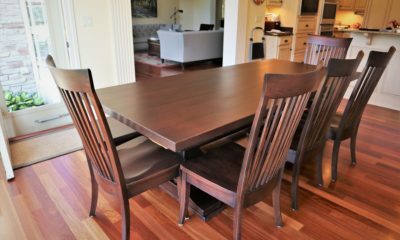 Now, if you insist on a table set complete with all wood pieces, all the while maintaining a formal design, likely the best way to achieve this is darker tones with a clean, satin surface. 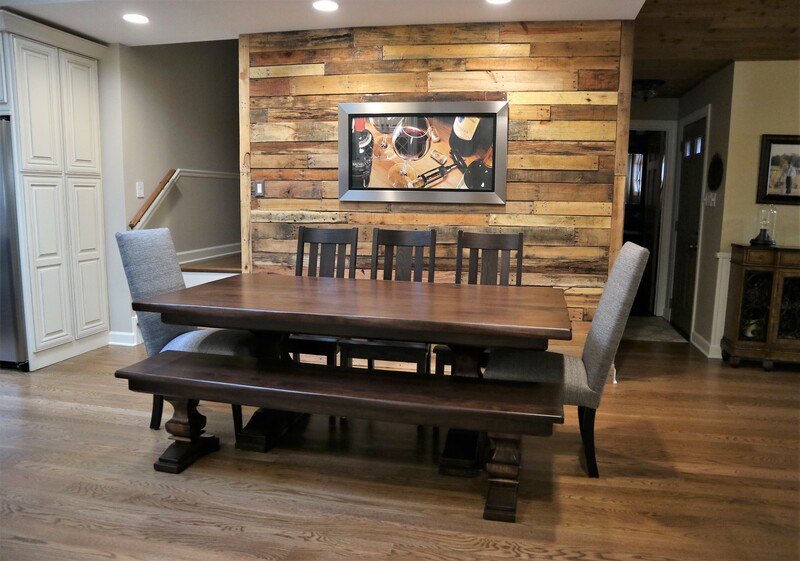 To add a twist to our formal vs. informal discussion, we are now finding that many homes are foregoing a dining room and have a kitchen space that doubles as both the kitchen and dining room. This being the case, more often than not, homeowners want a complementary blend of fancy dining and functional kitchen. Thus, blending deeper tones, fabric chairs or even seats, with a bench can create the perfect combination of design that both rooms hold. It’s only a matter of finding the right combination. On a side note, if you’re heart rate just went up at the thought of fabric on kitchen chairs and the amount of scrubbing you may have to do, you clearly haven’t heard of Crypton Fabric. Click here to find out why this fabric is so fantastic. For some, they use their furniture as a way of expression and gravitate towards trendy pieces. While others are looking for furniture that is “in style”, but perhaps exudes a bit more of a practical vibe. This brings us to what we’d deem as traditional vs. industrial. Both have more versatility than their names imply. Our main purpose in mentioning these two categories in this, industrial or modern often introduces metal into the mix. 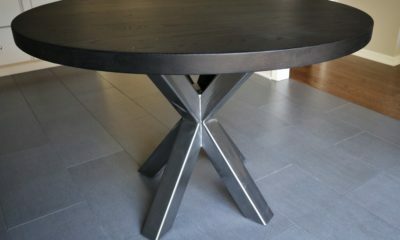 Whereas, traditional remains as table sets with all wood or even fabric thrown in. 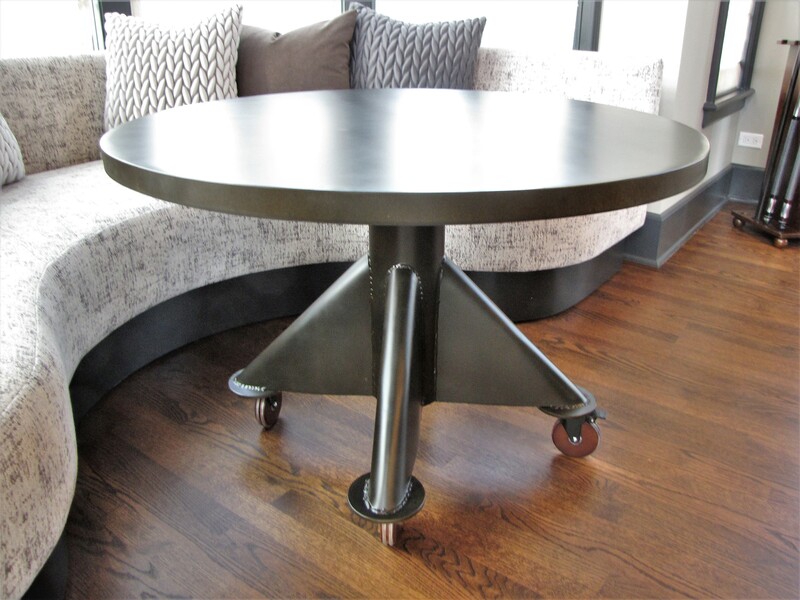 With industrial table sets, metal can be introduced in more ways than one. 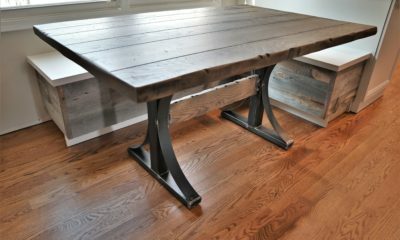 These can range from a fully metal base with a wood top, a metal base with a wood cross brace (need clarification on what a cross brace is, click here), a wood base with a metal cross brace, a metal top and base, only a metal top, and metal detailing just to give you a few examples. For some this can even go as far as selecting chairs that have metal details while others choose fabric or all wood chairs. There are dozens of choices between your traditional and industrial table sets. It’s just a matter of personal needs and likes. The possibilities are endless as this just scratches the surface of designs, mixing, matching, and functionality. Simplified these few categories discussed above can be a start in the thinking process of what works in regards to design as well as what you need and want in your home. With furniture and design the possibilities are endless. There is not one correct way. Mix it up, have fun, and create a clear goal for your space. 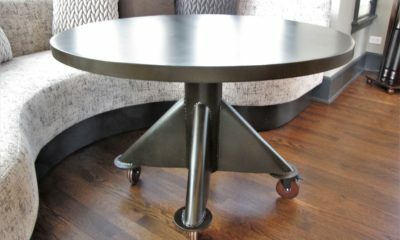 Curious what works when it comes to choosing tables, chair design, color, etc.? 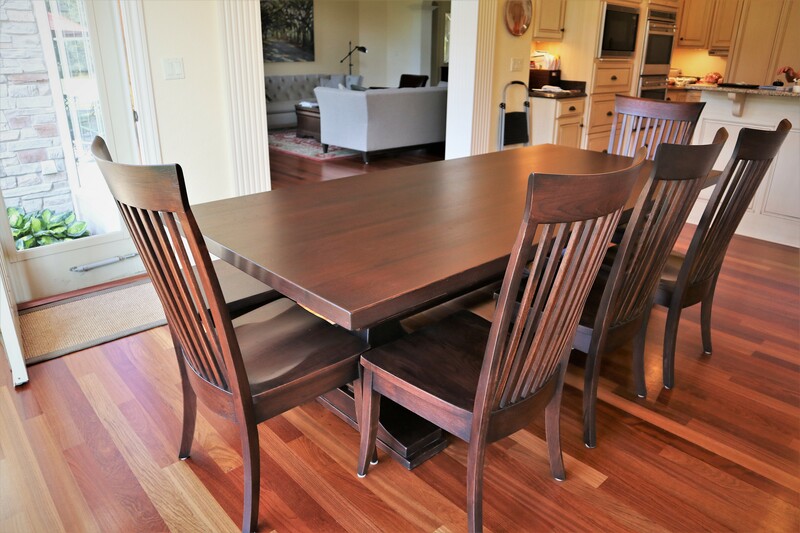 Check out our Table Portfolio to see past examples of our table sets in customer homes. If you want to hear what previous customers had to say about our help in the decision making process and the quality of work, click here to access our Testimonials page. As always, if there’s any questions we’ve left unanswered, feel free to contact us.